Billy Mag Fhloinn was born and raised in a musical family in Limerick City. He began playing traditional music in 1996, beginning on the bodhrán. He then progressed to the bouzouki, after a chance find of an old Greek model in a music shop in Limerick. 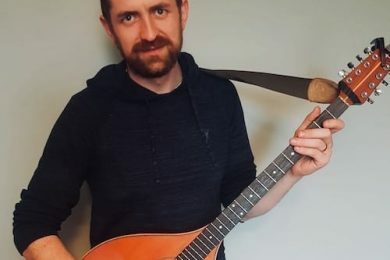 He learned much of his playing from musicians Mick Broderick and Tony Davoren when living in Dublin, and gained great experience playing the wild dance music of west Kerry when living on the Dingle Peninsula. 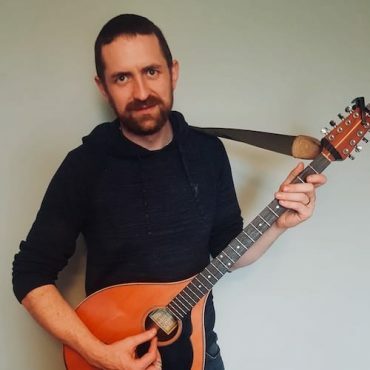 He has recorded on several albums as an accompanist, and has shared the stage with a variety of performers, including Muireann Nic Amhlaoibh (another OAIM tutor), Mairéad Ní Mhaonaigh, Gerry O’Beirne, Éamon Doorley, Donal Clancy and Ross Martin. When not playing music, he lectures in Irish Studies at University of Limerick and Mary Immaculate College.